If you've known me for a long time you'd know me as the lord of hypervisors. If a task exists, I'll virtualize it. A long time ago I experimented with domains-- this thing that for the longest time to me was some superworkgroup that businesses used. Turns out I wasn't that far off. At the time I had two VMs: one ran Windows XP Professional, another ran Windows Server 2003 R2. I could get them to network to each other and they lived in the same domain- I even got Remote Desktop Services working for a brief. Recently I was pondering on this and thought to myself "what if I cranked this up to 11? I have the resources to do that now". I didn't crank it up to 11. But I did crank it up to 4. This is the NT Experience, my relatively complete dive into the past and an exploration on how the enterprise ran in the mid-90s. Buckle up, this will be the deepest 25-year-old software dive you'll have ever seen. Unless you have actual hardware, which it seems most of the active userbase does. Then this will just seem like yet another software experience log. 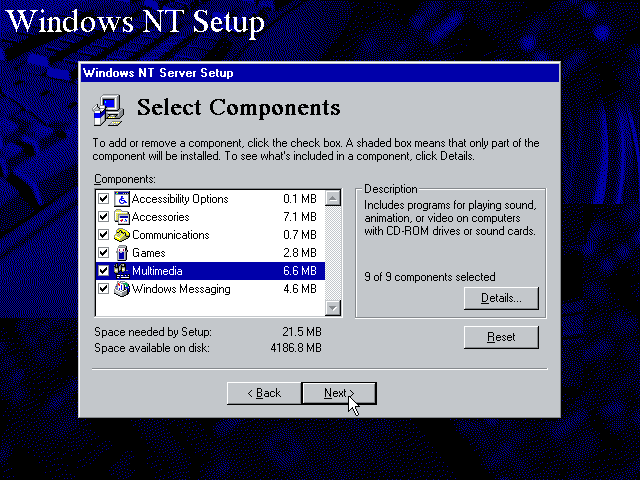 A lot of the software I feature in the NT Experience can be found right here on WinWorld. In fact, the first time a software is mentioned there will be a link to the Library page for it. If you didn't catch them, go back to the table of contents. That said, not everything can be found on WinWorld, and for those pieces of software, Google is your friend (but I use Bing don't @ me); or you can check the Appendix of each volume for every link in list format so you don't have to go searching. Throughout the NT Experience, I have installed a collective eight virtual machines, each with a different flavour and a different purpose- for example, I have an NT 3 Server and an NT 3 Workstation install; and there's even more for NT 4. For this reason, screenshots that are in the sections will only come from one of the installs and not all of them unless there is enough of a difference to warrant more than one. You can read the sections in any order you choose and you can even skip sections if you wish. I designed this series with to-the-pointness in mind. I wanted the complete experience going in to this, as well as both the NT 3 and NT 4 experiences. This means I had to grab eight OS packages; for NT 3: Server and Workstation; for NT 4: Server, Enterprise Server, Terminal Server, and Workstation. I also grabbed the corresponding latest BackOffice software packages for both NTs. For this volume, we're only going to focus on Server and Workstation; I'll cover BackOffice and NT Terminal Server 4 in their own dedicated volumes. But why NT 3 and NT 4? I want to see how compatibility between the two are (detailed further in Section VI); are NT 3 and NT 4 cooperable? As I said in the Foreword, there will only be one set of screenshots for installation of each version of NT. Specifically, I'll be using screenshots from the Server SKUs; the Workstation installs are very similar but with a few screens removed- I'll denote them. 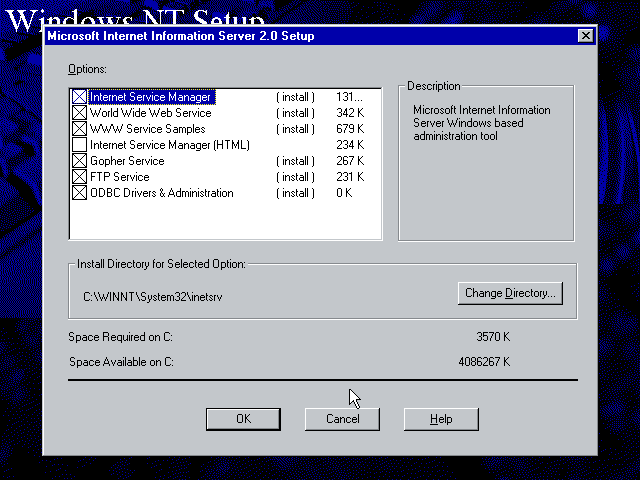 I know that when people think of Windows NT, version 4.0 is what comes to mind. Still, the origins lie in the 3.x days. For the experience of NT 3, version 3.51 is what will be used. It's just the easiest to work with. If you decide to follow along, download the Workstation version that isn't "chk". I found out quickly that that version crashes often and doesn't include the bootdisks. Server doesn't have such a version so this isn't an issue. And you will need the bootdisks for the 3.51 CD is not bootable (that came with NT 4). Gotcha: Real quick, I also ran into a problem where NT 3.51 will stall on the boot screen to the installer. Setting the VMware machine compatibility to 5.x fixed this issue. Thanks calvin for the piece I needed to make this work. VirtualBox does not have this issue in my experience. When configuring NT virtual machines, VMware will not give you a floppy drive by default; you will need to add this yourself. Also, the hard disk will be configured as SCSI by default. NT doesn't carry the drivers on the install discs for the SCSI virtualization. VMware tells you that you can get the drivers and you can probably make a floppy image or something or another but my solution was just to put the hard disk on the IDE interface instead. VirtualBox does not have either gotcha. Technically you will not need a floppy drive for NT 4 but it's a good idea to add it anyway (I'll mention this in the next section as well). When you attach the ISO image and the first floppy image to the VM (or real hardware! forgot about that), you can start the machine and the install. 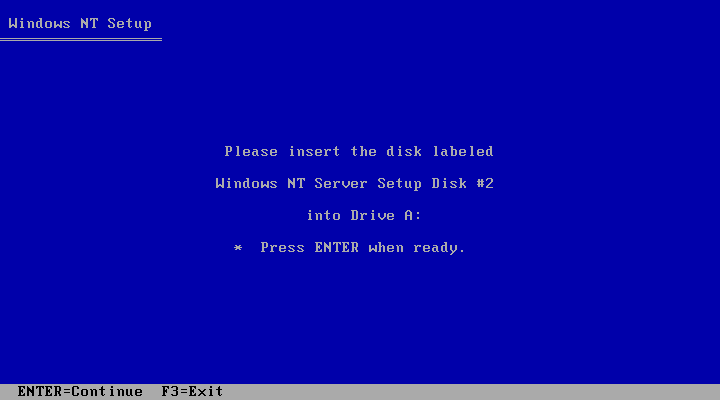 If you've run through the blue screen installer before this is nothing new for you. Going through the various prompts will eventually take you to a screen which you can then switch to the CD for installation. 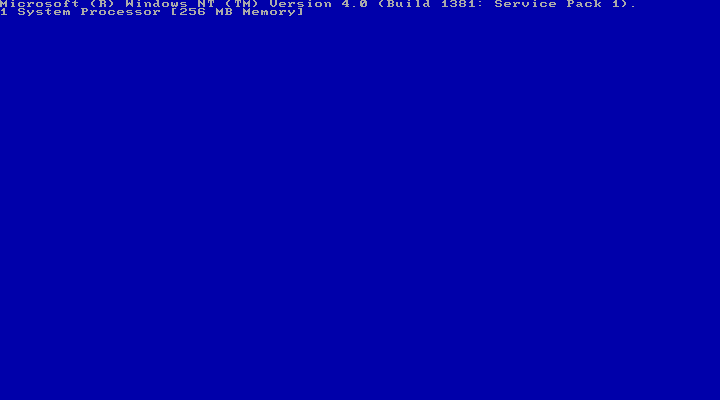 Then after the blue screen part and a couple of reboots it will take you to the GUI portion of the install. Gotcha: The bootdisks are SKU-locked. The installer will yell at you if you insert the wrong flavor of NT into the disc drive. Gotcha: Regardless of what partition format you select when installing, NT 3 (and NT 4!) will always format the install partition as FAT, and then convert the partition to NTFS if necessary. FAT32 support (and direct NTFS formatting) didn't make it in the stock installer until Windows 2000, so the partition in the installer is limited to 4,095 MB. If you have an already preformatted NTFS (old NTFS, NT 3/4 won't touch the newer versions!) partition, then the installer won't throw a fit and will install it regardless of the partition size. NT 3 won't even need more than 4 GB of disk though so this isn't a major issue. 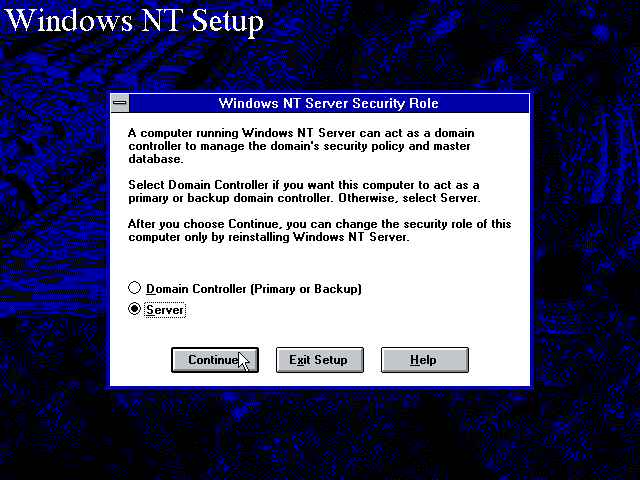 The GUI install runs similarly to Windows 3.1 or 95's, with a few NT-centric things such as identification information (domain or workgroup), and on Server versions if this is to be a domain controller. The Server version also prompts right after the network setup if you wish to install IIS, if you domain join the server. IIS 1. SVR - Are we a domain controller? After it installs the core files, NT 3 is DONE installing. It'll restart, you'll get the login screen, and then the oddly nostalgic-feeling Program Manager. Now we need to update it. 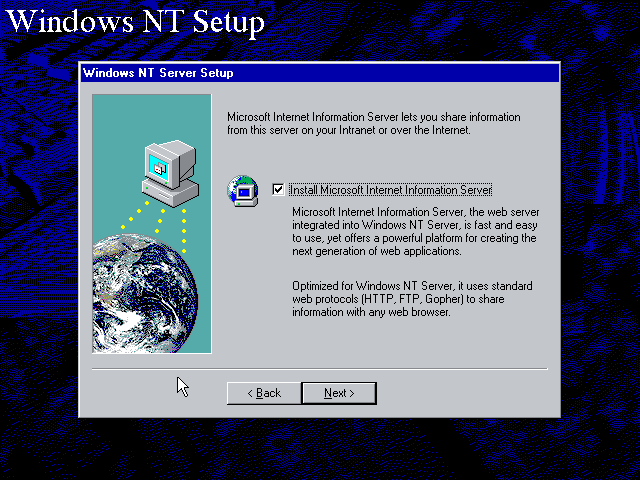 In Section V.
Now this is what comes to mind when people think of Windows NT. Luckily, there aren't as many versions of NT 4 as there were for NT 3. 4.0 is all there was, so it's easy enough. There's no floppy disks to fumble around with either, as the install disc for NT 4 is bootable itself. When configuring NT virtual machines, VMware will not give you a floppy drive by default; you will need to add this yourself. Also, the hard disk will be configured as SCSI by default. NT doesn't carry the drivers on the install discs for the SCSI virtualization. VMware tells you that you can get the drivers and you can probably make a floppy image or something or another but my solution was just to put the hard disk on the IDE interface instead. VirtualBox does not have either gotcha. Technically you will not need a floppy drive for NT 4 but it's a good idea to add it anyway. Attaching the ISO image to the VM or popping the disc in on real hardware and firing it up will bring you to the familiar blue screen of installer. If you've been here before (for installs of any Windows pre-Vista) then this will be familiar for you. When it's done, it will reboot and you'll enter the GUI half of the install. Gotcha: Regardless of what partition format you select when installing, NT 4 (and NT 3!) will always format the install partition as FAT, and then convert the partition to NTFS if necessary. FAT32 support (and direct NTFS formatting) didn't make it in the stock installer until Windows 2000, so the partition in the installer is limited to 4,095 MB. If you have an already preformatted NTFS (old NTFS, NT 3/4 won't touch the newer versions!) partition, then the installer won't throw a fit and will install it regardless of the partition size. This may be an issue if you plan on installing quite a few programs on NT 4. The GUI install looks like someone had an illegitimate child with the GUI installs for Windows 95 and 98. Seriously. In any case, it's very similar in execution to NT 3, but likely with a few small screen order tweaks, a couple of new things, and IIS 2! Woah!! After answering a few more questions, setting time zone and display settings, NT 4 installation is COMPLETE and all that it needs now is a few updates. On to Section V! The installs went well, but now we need to make them really shine. For this, we need some updates. These updates are also required by whatever hypervisor tools you install for NT 4 (both VMware and VirtualBox require at least SP6). 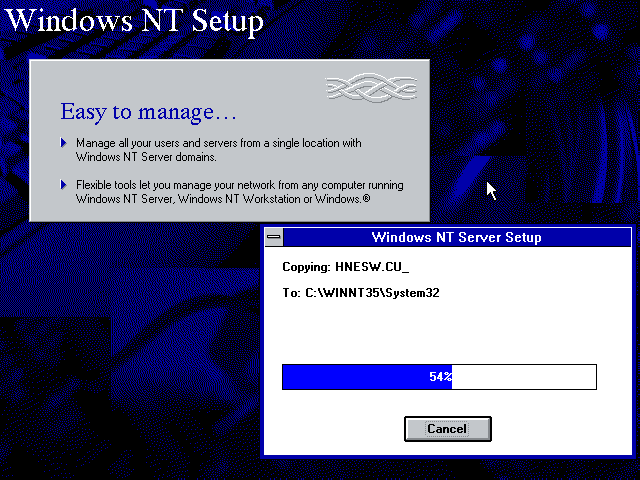 WinWorld provides SP5 for NT 3 and SP6/a for NT 4 in the Patches section for each OS. Also, we're gonna need a display driver for NT 3, because VMware Tools (and as far as I know VB Guest Additions too) doesn't support NT 3. I sourced my driver from VBEMP NT Project. Specifically, I grabbed the 2010 release, since the newest one didn't work very well (it would crash on post-install reboot). Without a shared folder to cheat with, I made an ISO image out of it, which I'll include in the Appendix (it also includes IE5 and IE6). Install the service packs first. For NT 3, this is a quick and dirty copy executable (UPDATE.EXE in the NT351SP5 folder), NT 4 is a self-contained executable (there are three in the root; one of these is for high encryption, one is for standard encryption, and the third is for Terminal Server). Next, NT 4 can install the VMware Tools just like on any other VM. For NT 3, the display setup is a bit different. I copied the contents of VIDEO\VBE20\NT35X to a folder on the drive (like C:\VIDEO); and the contents of VIDEO\OEM go into the same place. I then went into the display properties and changed the display type, selecting Other at the driver selection. Then, to finalize the setup, I made the background black. Because black. Now we have (mostly) totally up-to-date NT installs that look great as well! This is where everything begins falling apart. I started on the NT 4 side, creating a domain on my Enterprise Server VM, making the regular Server VM the backup DC, and domain joining all the VMs to that domain. That's great and all, but I ran into a major gotcha. Gotcha: The domain formats for NT 3 and NT 4 are fundamentally incompatible. One version can't domain join to the other's domain and vice-versa. So I ended up making two domains: one for NT 4 machines and one for NT 3 machines. Now, these two versions predate the idea of a hierarchical domain structure and forests, so it's not like I could just make these two domains members of the same forest; these domains are completely and entirely separate from one another. This is fine, though, as I'd likely have run into other odd compatibility issues. In the next volume of the NT Experience, I'll dive into the BackOffice software suite and the goodies it contains. Nice guide. Thanks! I'd been considering messing around with this myself. Nice. Although you may not be able to directly join NT4 and NT3 domains, you may be able to establish domain trust between the two. That may be even more interesting. Can't guarantee that it will work but worth a shot.